Spring has officially sprung here in Ann Arbor, which means that the sun is (sort of) shining, the townies are out and about, and the next American Institute for Conservation (AIC) annual meeting is just around the corner. Suzanne continues in her role as VP/ organizer-in-chief of the conference program, whose theme this year is “New Tools, Techniques and Tactics” in conservation. This year I’ve got a pretty cool job too, as I’ll be chairing a special session on research strategies in settings with limited resources (think archaeological sites, small museums, etc.). This is a topic I’ve been interested in for a while, and I was happy when it was accepted as one of six concurrent sessions that are proposed and organized each year by AIC members. The idea of member-proposed sessions is relatively new to AIC, and a great thing about them is that they tend to cover topics that appeal to conservators who work on different materials (like objects, paintings, books and paper, textiles, etc.). Other session topics include imaging, gel cleaning, and contemporary art conservation. Conservators and scientists presenting in my session work within a range of specialties, including architecture, archaeological materials, indigenous heritage, electronic media, and preventive conservation. I’m interested in learning how these folks figured out how to conduct analysis on materials in remote areas, or adapted a well-known investigative technique to a new research question. In other words, I want to explore the penchant for problem-solving that so many conservators have, regardless of the types of objects they work on. For any conservators reading this post, we encourage you to drop in on one of these sessions and hope to see you at AIC New England in May! Evidence of spring outside the Kelsey! From December 6th to 9th, I had the opportunity to participate in two separate conferences on two different continents in different capacities. At the University of Edinburgh, I was invited along with U-M Classics professor Nicola Terrenato to give a talk about early Latin society and state formation based on evidence from Gabii, Italy, at the international conference The Dawn of Roman Law. Back in Ann Arbor, the Kelsey Museum was gearing up for Into the Third Century: The Past, Present, and Future of Michigan’s Archaeological Museums, a graduate and undergraduate student symposium sponsored by the Collaborative Archaeology Workgroup in conjunction with the bicentennial exhibition Excavating Archaeology @ U-M: 1817–2017 (which is currently on display at the Kelsey Museum). As one of the graduate student organizers for the event, I felt that I should do everything possible to make sure it went as smoothly as possible. I arrived in Edinburgh, Scotland, on the morning of December 6, about two hours before the beginning of the conference. What followed was approximately 36 hours of extended presentations on topics ranging from the use of the dative in the Twelve Tables to an Etruscan inscription that may be one of the earliest moments ever found for the culture, of dining on Scottish delicacies as well as quite odd Italian-Scottish fusion, and sleeping the sleep of the jet-lagged. Following our well-received presentation, however, it was necessary to switch gears quickly from presenter-mode to that of an organizer/administrator for the symposium back in Ann Arbor. Organizing a conference is not easy. One must arrange and purchase meals, airport rides, and hotel rooms for the participants, reserve and set up lecture venues, create schedules, prepare introductions, cajole speakers, clean up, and deal with the inevitable technology issues that will arise. Fortunately, the team of doctoral candidate Kimberly Swisher from Anthropological Archaeology, Kelsey Museum educator Catherine Person, and myself had each other to help spread the load. After an excellent keynote address by Lisa Çakmak (Associate Curator of Ancient Art at Saint Louis Art Museum and IPCAA alumna) on Friday night, Saturday went smoothly with presentations by numerous graduate students from IPCAA, Anthropological Archaeology, and Classics, as well as remarks from the directors of the Kelsey Museum and the Museum of Anthropological Archaeology, Terry Wilfong and Michael Galaty, respectively. At the same time, there were multiple posters presented by undergraduate and graduate students and a technology session where participants could try out the newest technology for presenting archaeological materials to the general public. Overall, although an exhausting couple of days, it could not have gone any better! At the end of May, I attended the big professional conference for conservators in the United States — the annual meeting of the American Institute for Conservation. This was a special meeting for me because I was in charge of the program for the “Objects” group. This group has about 900 members, all of whom focus on the conservation of three-dimensional art and artifacts — in other words, objects. Usually at a conservation conference, I attend the presentations about archaeological conservation because that’s what will help me most in my work for the Kelsey. But this year, because I was the program chair, I had to be there for ALL the papers. I wasn’t sure I’d enjoy it, but it was great! 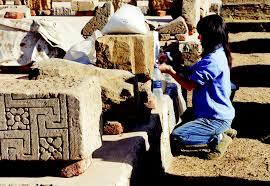 Conservator Hiroko Kariya at work at Luxor Temple, Egypt. Photo from the University of Chicago/Oriental Institute Epigraphic Survey webpage. View of the Watts Towers. 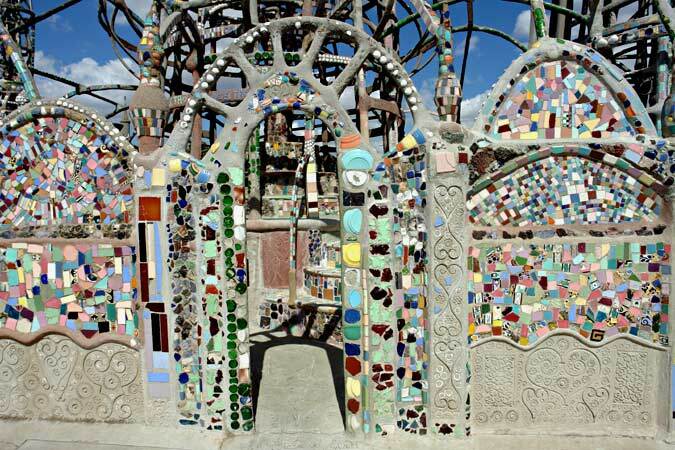 Photo from the Watts Towers webpage. I also heard about the National Air and Space Museum’s amazing research and conservation of a Nazi Bat Wing stealth fighter aircraft made out of plywood (you can read a recent post about this work here on the NASM blog) and about preservation of animation cels at the Walt Disney Animation Research Library. I learned about how conservators at the Arizona State Museum are treating pine-pitch–coated Native American baskets, and about how a team at the Field Museum of Natural History in Chicago used CT scanning to virtually restore a skull from the Magdalenian Era. Magdalenian Era skeleton, with subsequent virtual facial reconstruction. Photo from University of Chicago Radiology webpage. See a Field Museum video about this project, featuring conservator JP Brown, here. I gained a surprising amount of useful information about the treatment of complex, composite objects from these papers. This is knowledge that I can, actually, apply to my work at the Kelsey. Continuing education rules!